Second language acquisition; Study and teaching. 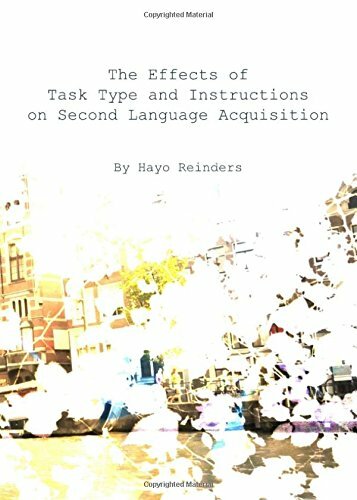 Amazon.com description: Product Description: Recent years have seen a growing interest in the role of tasks in second language acquisition and a substantial body of research now exists to show their potential contribution to language learning and teaching. However, not much is known about the effects of different task types, nor about their accompanying instructions. Which tasks are more successful under what circumstances? What type of instructions should be included? This book attempts to answer the questions above by first examining previous studies on the use of tasks, the roles of input, output and interaction, and by placing these in a broader cognitive framework. It argues that in order to understand the effects of different task types, it is important not only to look at learning outcomes (acquisition), but also at the effects on immediate task performance (intake), and by doing so, to arrive at a more complete picture of the learning process. The book presents the results of a study on the effects of: implicit and explicit inductive instructions, and three task types on both intake and acquisition of two English grammatical structures. The study used various measures to determine intake as well as the development of both implicit and explicit knowledge. The results of the study support the claims made for the benefits of Focus-on-Form, but do not support the claims made for the benefits of more explicit types of instruction. Further, the results show that there is no direct relationship between intake and acquisition and that different task types can have a differential effect on immediate task performance on the one hand and learning on the other. The book discusses these findings in light of previous research and considers their implications both at the theoretical level, as well as for language teaching practice. About: Recent years have seen a growing interest in the role of tasks in second language acquisition and a substantial body of research now exists to show their potential contribution to language learning and teaching.